Franchise India 2009, the 7th edition of Asia’s Biggest Franchise & Retail Opportunity Show held on 26th & 27th November 2009 at Ashoka was a enormous success and was referred to by Franchise Experts who flew in from various parts of the world to be the biggest franchise show not just in India across the world, and for Indians the show proved it effectiveness in facilitating not only franchising & Retail growth but encouraging small business development and entrepreneurship. For anyone looking to buy a franchise or invest in a business opportunity or someone contemplating franchising or distribution of their products or services, Franchise India 2009 Expo had over 300 Business Opportunities to offer– from those in retail in category of F&B ,Fashion & Lifestyle , Specialty concepts to service based opportunities in education & Training, Health and wellness ,niche services – all businesses thriving even in this depressed economy as the public opt to ‘repair rather than replace’. 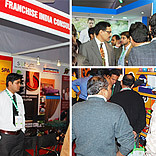 The Franchise India 2009 show included companies where investments started from as much as Rs. 50,000/- and went on to millions for Master or regional franchise opportunities. Franchises in the business-to-business sector were also found benefitting– from printing to personnel to financial and IT services like Print Studio, Antal International, ICICI Securities etc. The Expo also boasted of an exclusive international pavilion showcasing enormous opportunities from 5 countries – UK, US, Philippines, Dubai and Australia Fashion Brands like Admiral- Sportswear & Lifestyle Brand from Uk in Food - Kenny Roger Roasters, Retail Food Group, bb’s café, Brumby’s GO, Donut King, Michel’s Patisserie, Brumby’s and Voltz Energy drinks, service based brands such as Better Homes, , education & training brands like Fast Track Kids ,Trilux, and Health & Wellness Concepts like Meditravels,USA. Food franchises and retail franchises in Fashion & niche categories reported remarkable trading response , with their strong branding standing them in good stead .Whilst many of the top brands like Koutons, Aptech, Archies, next, Welhome ,Kwality Walls, Numero Uno, Subway etc established their strong and dominant position in the market New to franchising and capitalizing towards franchising for the first time in India were Brands like Travo, Brats N Cuties, Identiti, Jiffy Juice were of the view that timing was perfect to launch their concept at Franchise India 2009. With the higher success rate of franchising as opposed to independent businesses, there is no question that Business Investors whose numbers exceeded over 25,000 at the show were looking for expert advice & Business Opportunities on how to start a franchise, run a business and be successful. Exhibitors who were thoroughly busy over two days found their business literature flying out of their stalls in no time. While positive feedbacks for the show are pouring in ,Some of the early response we have received towards the show is very encouraging.